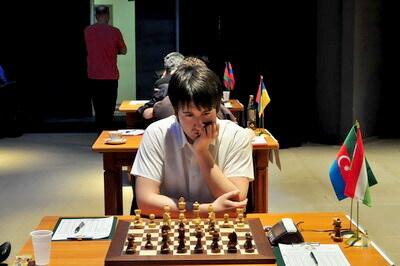 The Ukrainian grandmaster Pavel Eljanov took the lead after defeating Wang Yue in the round 5. Another Ukrainian player Vassily Ivanchuk defeated his compatriot Ruslan Ponomariov. Other games of the 5th round ended in draws. Eljanov, who had Black, was forced to defend a difficult position for the most part of the game. The Chinese obtained a big space advantage following a temporary pawn sacrifice in a well-known variation of the Slav Defense. Prior to the control move Eljanov managed to complicate the game with an exchange sacrifice, and Wang Yue got nervous. First he missed the winning continuation, and then, after the control was already passed, blundered a rook instead of transposing to a better ending. Vassily Ivanchuk won his first game in Astrakhan, defeating his arch-rival Ruslan Ponomariov. Ponomariov, having White, got a slight advantage after of the opening, but made an unsuccessful pawn sacrifice on the 22nd move and gave away the initiative. White’s problems got worse after he missed Black’s strong bishop maneuver. After the first control Black already had a winning position. Ivanchuk won on the 50th move. Vugar Gashimov missed a victory against Vladimir Akopian. The Azeri player created strong pressure in the Ruy Lopez. The Armenian made a dubious pawn sacrifice, intending to make a draw by repetition, which indeed happened in the game, however, grandmaster Sveshnikov, who does live commentary for the Astrakhan public, showed that White missed a forced win. Teimour Radjabov and Peter Leko played a lengthy theoretical line in the Queen’s Gambit. The Hungarian was prepared quite well and equalized without much trouble. The players traded a few pieces, and Radjabov ended the game in a draw by perpetual. A quick draw occurred in Mamedyarov-Svidler. Peter Svidler selected his favorite Gruenfeld Defense, and Mamedyarov opened the game on the queenside. A sharp tactical battle ended in mass exchanges that led to a completely even position. The players asked the technical advisor, grandmaster Zurab Azmaiparashvil, to confirm this assessment before agreeing to a draw. Boris Gelfand easily equalized as Black against Evgeny Alekseev. Alekseev went for the Bishop’s Opening, and the Israeli player replied with active operations in the center, depriving White of any opening advantage. The players started repeating moves soon after the opening. In the game between the two Russians, Ernesto Inarkiev and Dmitry Jakovenko, Black (Jakovenko) selected a very solid but passive Berlin Variation of the Ruy Lopez. Inarkiev had the initiative throughout the game, but was unable to achieve anything real. Jakovenko accurately made a draw in the ending with opposite-colored bishops. Saturday is a day off. The 6th round of the Astrakhan stage of the FIDE Grand Prix is played on Sunday, May 14th.